SAN FRANCISCO & LONDON–(BUSINESS WIRE)–Symphony Ventures, the global services firm specializing in Robotic Process Automation (RPA) and Intelligent Automation, is pleased to announce that it has been recognized by Blue Prism (AIM: PRSM) as one of only two certified Gold Level Capability Providers in the world – and the first RPA Pureplay to achieve such a distinction. This latest achievement builds upon an already deep and long-standing relationship with Blue Prism. 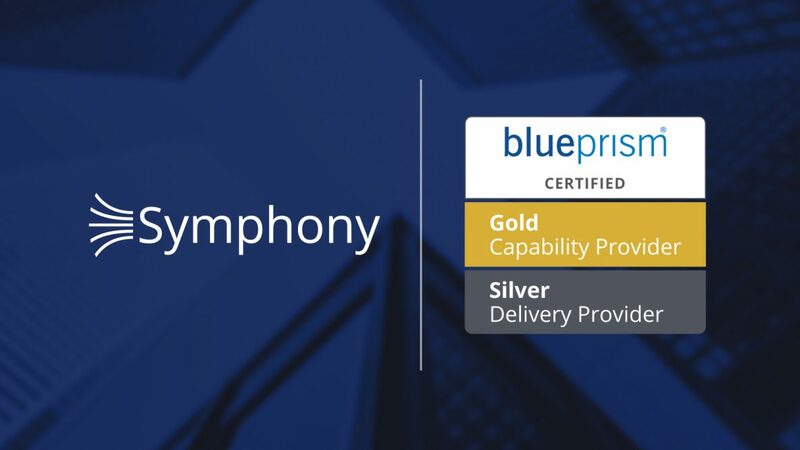 In addition to its Gold Capability Provider status, Symphony is also a Silver Implementation Partner and an Accredited Training Partner of Blue Prism. Established as a process-first digital solution provider, Symphony has developed an unrivaled team of RPA and Intelligent Automation experts across the globe. The company also offers a toolkit of accelerators and pre-built modules that make it the firm-of-choice for enterprises serious about deploying RPA quickly and successfully. This Gold Capability Provider certification comes on the tail of winning the coveted Blue Prism ‘Best Practice and Implementation Award’ in June 2017. This recognition further cements Symphony as one of Blue Prism’s most decorated and holistic partners with a proven track record of enabling global enterprises to develop capabilities and deploy enterprise-grade digital workforces at scale. To achieve the Gold Capability Provider certification, Symphony met Blue Prism’s rigorous requirements, demonstrating excellence in client support, adhering to the Blue Prism Robotic Operating Model (ROM) and achieving large-scale deployments of more than 100 active robots in production for leading enterprises in numerous industries. Applying best-in-class approaches and processes, including Symphony’s proprietary factory model – which accelerates design, configuration and testing of enterprise-grade RPA deployments – positions Symphony to offer clients world-class expertise and unrivaled experience. Symphony Ventures recently shared an example of a large-scale partnership and success on a Blue Prism Café hosted webinar titled, ‘Roadmap to Self Sufficiency.’ During the webinar, Lloyds Banking Group discussed how Symphony has assisted the organization with capability development, design and extensive implementations on the road to a significant enterprise-grade RPA deployment. The webinar can be found on Blue Prism’s website here.